Reliable scholarly translations of the Tipitaka are freely available in English on the internet. 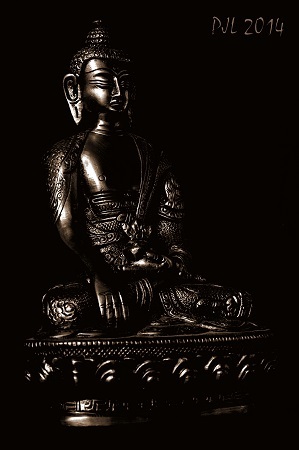 If you read them you’ll discover that “Buddha” is not a name but a title meaning “Enlightened” or “Awakened”. The “Enlightened One” or “Awakened One” is Siddhatta Gotama, a noble warrior prince who became disenchanted with the human condition of birth, ageing, sickness and death and wished for a solution. Gotama renounced his luxurious life and embarked upon a spiritual quest at the age of 29. After six years of intense mental and physical training that almost killed him, he eventually found the Middle Way between hedonism and asceticism that enabled him to achieve Buddhahood – the condition or rank of a Buddha or Enlightened One. On attaining enlightenment Gotama Buddha is said to have wandered around Northern India conversing with gods and humans, teaching his doctrines and performing miracles (clairvoyance, invisibility, teleportation, etc.) He gathered many followers before dying eventually at the age of 80. Inevitably there were disagreements on matters of doctrine and practice and the community of monks and nuns and lay followers began to splinter into factions. The Buddha’s teachings evolved and multiplied as they were recited and eventually written down throughout India and beyond. According to the scriptures, when all of Gotama Buddha’s remains (bones, relics, sermons, etc.) eventually disappear from this world it will be a dark time for all. However when the time is right an eighth Buddha, Metaya, will appear to continue the teaching of the Buddhas and bring light into the world once more. Can such ancient mythology be used to construct a reliable factually correct biography of Siddhatta Gotama – the so-called “historical buddha”? I don’t think so. Unfortunately the scriptures are all that we have. I see no reason for believing that these “corruptions” contain the kernel of an earlier non-religious philosophy taught by a wandering contemplative who was “just a man”. More often than not the only evidence I see being cited for such conjecture is the very same texts that are frequently alleged to have been corrupted by religious accretion and syncretism. In short, the more we understand the myths and legends of the Buddha the less likely we are to view them as “popular Buddhism” – degeneration from reason (philosophy) to religion (mythology). These ancient narratives are about liberation not attachment. Their truth isn’t a matter of historical factual correctness – it’s a matter of the presence or absence of mental suffering when we internalise the message and strive to live up to it. ‘The Marks Of The Superman’ (DN 30) translated from the Pali by T.W. Rhys Davids and C.A.F. Rhys Davids. Sutta Central. Last Modified 22 March 2017. See also, ‘Lakkhana Sutta: The Discourse on the Marks’ (DN 30), translation and commentary by Piya Tan, The Dharmafarers, 2007.